All of us are of course beyond thankful for the pets in our life, past, present, and future. 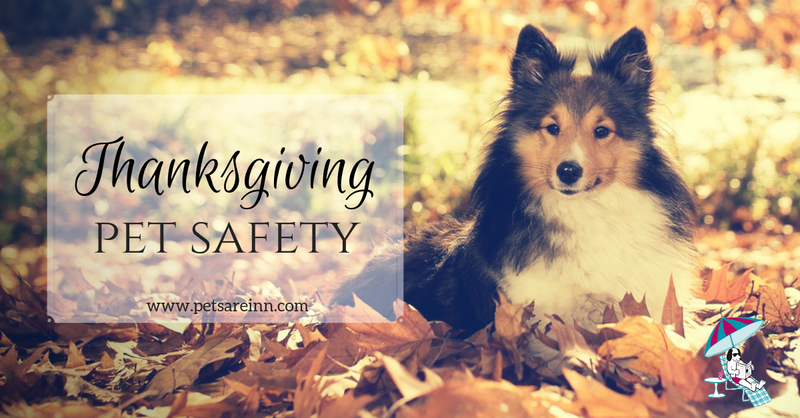 However we also need to make sure they are safe and stress free over the Thanksgiving holiday! Make sure your guests and any children know that although sometimes Bailey gets table scraps, these are an absolute no-no. They should also take care to not leave these items lying around where she can get to them! Check out these Thanksgiving Treat recipes! A lot can happen during Thanksgiving dinner. Make sure your pet is safe before, during, and after! Make sure your pets have proper identification on in case they do get out! Create a safe and quiet space where she can relax if she needs to without being bothered. A nice bed, blanket, or crate along with a bowl of water can create a stress-free place for her without any guests! Remind your guests to respect your pets, to not feed them, pull on them, or tease them. Young kids might need an extra reminder! Remind everyone about food safety and your pets. The list above is a good place to start, but also be careful at clean up time. Make sure to clean up items like foil, wax paper, and food wrappings that might smell delicious to your pet! Of course, keep the garbage secured out of reach as well! Reward your pet with some pet-safe Thanksgiving-themed treats so she doesn't feel left out!